Join us for the first of Newark Science and Sustainability, Inc.’s monthly Lecture Series. Following the success of the city-wide garden tour, we will keep gathering in Newark’s community gardens and urban farms throughout the year, leading up to next year’s garden tour! 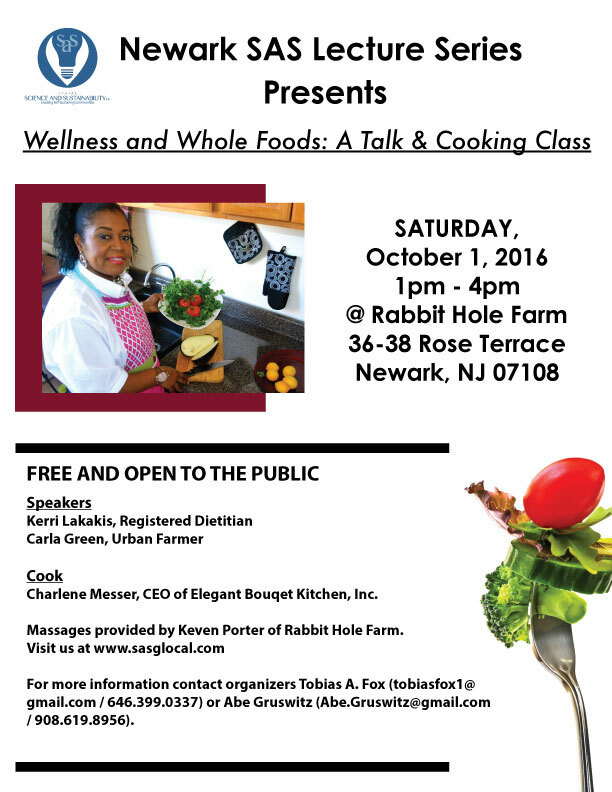 Charlene Messer, CEO of Elegant Bouqet Kitchen, Inc.
Kerri Likakis, Registered Dietitian of the Beth Israel Green House, will be speaking to us about nutrition and the importance of fresh, local whole foods. Following the talk, Charlene Messer will be cooking up something delicious, as she teaches us how to cook with whole foods. Keven Porter of Rabbit Hole Farm will set up some chairs and offer massage and healing during the event. For more information contact organizers Tobias A. Fox (tobiasfox1@gmail.com /646.399.0337) or Abe Gruswitz (Abe.Gruswitz@gmail.com / 908.619.8956). Posted in Blog, Community Gardening, Sustainability, Urban Agriculture.